Top Tip - Soak all wooden handled brushes in water overnight before use, this will swell the wood and trap in the bristles. Includes sizes 2 x 2" - 3 x 1.5" - 3 x 1" and 2 x 0.5" brushes. Includes sizes 2 x 1.5" - 2 x 1" and 2 x 0.5" brushes. Includes sizes 2 x 2" - 1 x 1.5" and 1 x 1" brushes. printed on the handle.Same brush,Same quality, same supplier just different name.The pictures will be changed as soon as possible. Includes sizes 1 x 3" - 2 x 2.5" - 2 x 2" - 2 x 1.5" - 2 x 1" and 1 x 0.5" paintbrushes. 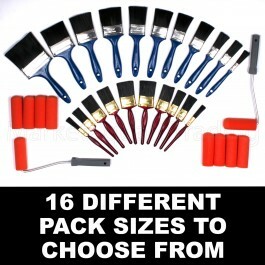 Includes sizes 1 x 3" - 1 x 2.5" - 1 x 2" - 1 x 1.5" - and 1 x 1" paintbrushes. 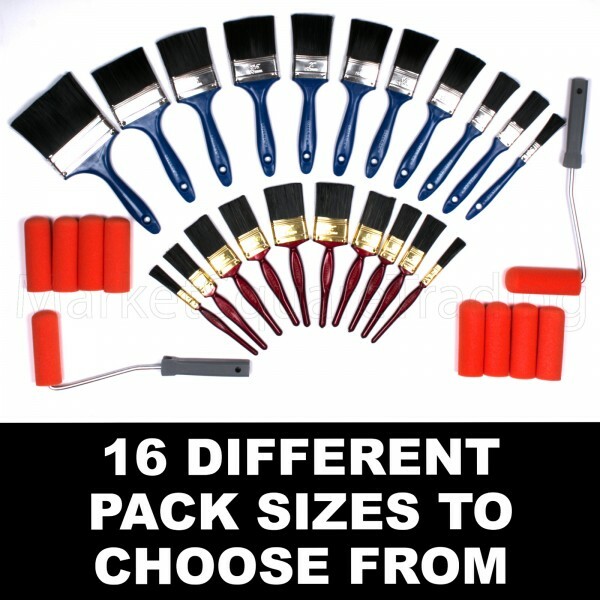 Includes sizes 1 x 2.5" - 1 x 2" - 1 x 1.5" - 1 x 1" and 1 x 0.5" paintbrushes. Instructions to extend large roller,---- Twist pole handle anticlockwise to unlock, pull to extend, twist clockwise to lock in place. Same applies to the top thinner extension. TOP - TIP If you are going to gloss with the mini 4 inch foam rollers, I have found it best to paint the surface with a brush then lightly run your roller over the area.This removes any brush stokes and gives you a quality smooth looking paint finiish.Please do not just put lots of gloss on the roller to apply or this will just be messy and the wieght of the gloss will just deform the roller shape. With emulsion you can just apply as with any roller.